Idaho officials have euthanized a snapping turtle at the center of an investigation over whether a biology teacher gave it a sick puppy to eat in front of students. 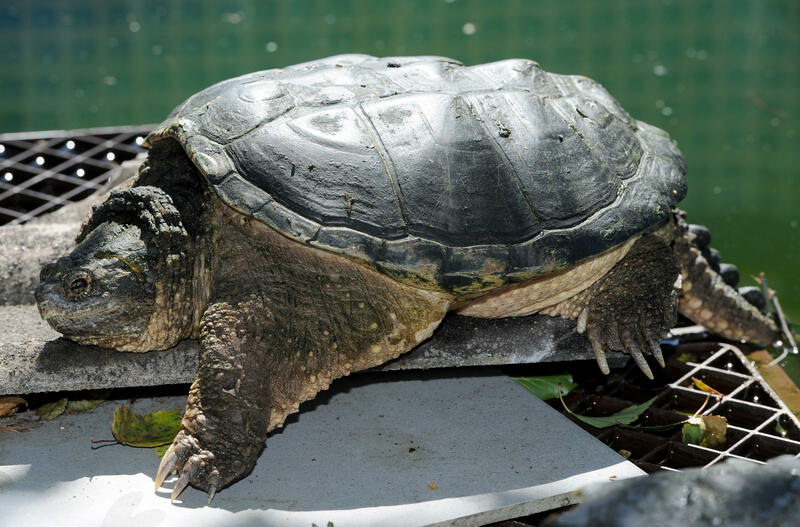 The Idaho State Department of Agriculture in a statement Friday says snapping turtles are an invasive species in Idaho requiring a permit. Officials seized the turtle Thursday. "Our concern is they are omnivorous, can be highly predacious on native species, can live a long time, and once they reach a certain size, they have few natural predators," said Fish and Game spokesman Roger Phillips. Investigators are looking into possible animal cruelty charges. The teacher has not been named by authorities, but the East Idaho News, citing a law enforcement source, identified the teacher as Robert Crosland. "He is a cool teacher who really brought science to life," a former student told East Idaho News. The uproar has forced police to step up security amid threats at Preston Junior High School and other schools in the district following the incident that reportedly occurred on March 7 in front of several students after school. Preston Police Chief Mike Peterson said Friday the threats were vague but linked to the allegation that the reportedly ailing puppy was fed to the turtle. "It was enough of a threat that our parents thought we ought to have a bit of a presence over there," Peterson said. He said two police officers and four Franklin County sheriff's deputies were stationed at schools on Thursday that are normally patrolled by one sheriff's deputy. The district doesn't hold classes on Fridays, but officers may return to provide added security on Monday. Peterson said the sheriff's office has submitted its findings of the incident to Franklin County Prosecuting Attorney Vic Pearson. But Pearson said his agency has a conflict of interest and earlier this week forwarded the report to another prosecutor in the region that he didn't name. He said in a news release that the high volume of calls being received by law enforcement and his office was "hindering our ability to complete what needs to be done to reach the end goal of justice in this case." Franklin County Sheriff David Fryar didn't immediately return a call from The Associated Press on Friday. The Preston School District's answering system said its mailbox was full and not accepting messages. But in a previous statement, Superintendent Marc Gee said the district became aware of "a regrettable circumstance involving some of the biological specimens." The Idaho Humane Society has called for an investigation and has contacted local officials offering its help. In a statement, it said it shares the concern "of all our constituents who are deeply disturbed by the news from Preston, Idaho, regarding allegations of the mistreatment of a puppy in a classroom setting." People for the Ethical Treatment of Animals in a statement said the teacher is a "bully who should not be allowed near impressionable young people." The 2004 film "Napoleon Dynamite" was set in rural Preston, which has a population of about 5,200. The film portrays a shy and unpopular teenager helping his friend run for high school class president. Reports of the puppy being fed to the turtle have put the town near the Utah border back in the spotlight, but in a negative way. "I think people are disappointed, disappointed that the incident happened," said Peterson, the police chief. "We don't want that media attention. This is a small town that runs at its own pace."